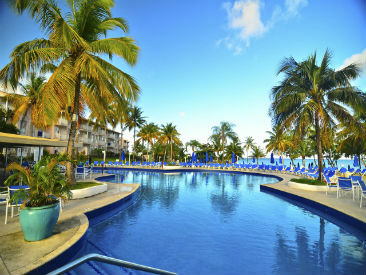 St. Jame's Club Morgan Bay is an all-inclusive resort set on the gorgeous tan and black volcanic sands of Saint Lucia. With 343 comfortable rooms, this resort offers singles, couples and families an elegant yet informal atmosphere for their vacation. Featuring four inter-connected pools, a swim-up bar, amazing dining options, luxuorious spa and fitness center. 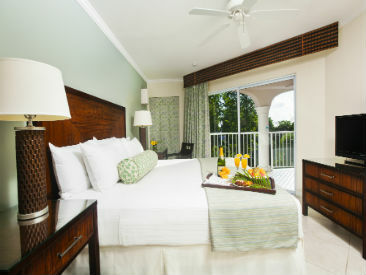 Escape from reality at the all-inclusive beachfront St. James's Club Morgan Bay, Saint Lucia. The resort combines an elegant, yet informal, ambience to offer singles, couples and families a high-quality all-inclusive St.Lucia vacation experience. 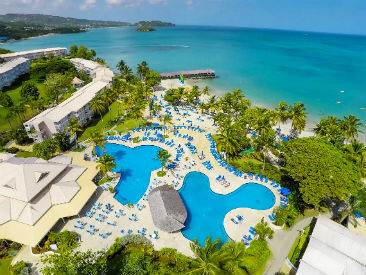 The resort is located along a stunning stretch of tan and black volcanic sand beach, only 3 miles from the the capital of Castries, and features four beautiful inter-connected pools, a swim-up bar, fabulous dining options and a spa and fitness center. Golf is available at the nearby Saint Lucia Golf & Country Club course. St. James's Club Morgan Bay, Saint Lucia is 1 hour from Hewanorra International Airport (UVF); 15 minutes from George Charles Airport (SLU). Helicopter Transfers Available: Helicopter transfers from/to Hewanorra International Airport (UVF) on the southern tip of Saint Lucia to/from the Helipad at George F.L. Charles Airport (SLU) on the northern end of the island are available for pre-booking. This 15 minute flight is a great way to get from one end of the island to the other as well as get an aerial view of Saint Lucia. At time of booking, you may select the standard roundtrip land transfers, one way helicopter and one way land transfers, or you may choose to take advantage of roundtrip helicopter transfers. Please note: Transfers to/from your hotel from/to the helipad are not included in the helicopter transfer rate. You may either get a taxi or purchase transfers from/to George F.L. Charles Airport to/from your hotel from Barefoot Holidays, our ground operator in Saint Lucia. The recent addition of 100 rooms includes an additional swimming pool, 32 new standard/deluxe rooms and 68 one bedroom suites, positioned on the edge of the hillside overlooking the resort and the Caribbean Sea, plus a great new bar - Tommy's Rum Shop! Please Note: Effective immediately, guests checking in at any Elite Island Resort must present valid government issued identification, and a valid major credit card at check-in. A $350 USD pre-authorization will be processed to the guest’s credit card to cover any incidental purchases and allow all guests to conveniently charge gift shop purchases, spa treatments and any other incidental purchases to their room folio, in addition to confirming guest identity and aiding with fraud prevention.